Britax FRONTIER G1.1 Harness-2-Booster Seats - Free Shipping! Car seat and booster seat designs are, for the most part, very similar: manufacturers have figured out the basic combination of elements that keep kids safe in the car, and they recombine those elements to create child safety seats that are attractive, comfy, and provide protection for our children when emergencies happen. It?s easy to forget, however, that those basic elements only do their job to protect your child if the car seat is installed correctly. The Britax Frontier 90 Combination Harness-2-Booster?, which accommodates kids from 25 to 120 pounds, features the latest advance in car seat installation: the CLICKTIGHT? Installation System makes it easier than ever to install your seat correctly every time, using your car?s vehicle safety belt. Color-coded safety belt guides help you get it right in harness or booster mode, and premium lower LATCH connectors are included, as well. True Side Impact Protection: The Frontier 90 car seat/booster has deep side walls and a head restraint lined with energy-absorbing EPP foam, which distributes crash forces, shields your child from vehicle intrusion, and contains her head, neck, and body to keep them properly aligned. SafeCell Technology: The base of the Frontier 90 Harness-2-Booster incorporates SafeCell Technology which compresses in the event of a crash, lowering the center of gravity and reducing the forward movement of the car seat. Product Dimensions Harness Min (in): 19W × 28H × 21D Integrated Steel Bars: This structure strengthens the connection of the car seat to the vehicle and reduces forward flexing of the seat in the event of a crash. Energy-Absorbing Versa Tether: The top tether uses a two-point attachment to anchor the top of the seat to the vehicle, minimizing the forward motion of the seat. 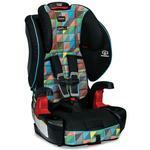 It also integrates stage-released stitching which reduces the crash forces that reach your child. HUGS (Harness Ultra Guard System): These chest pads provide resistance to forward movement. Compatible with SecureGuard? : This system, sold separately, works with the vehicle belt in booster mode to prevent your child from sliding under the lap-belt portion of the safety belt during impact, reducing the risk of abdominal injury. Harness: The tangle-free five-point car seat harness is designed to distribute crash forces across the strongest parts of a child?s body; it has 10 harness height positions, up to 20.5?, and has two buckle positions for a precise fit. The Quick-Adjust No-Rethread Harness system makes it easy to adjust the harness shoulder height and head restraint from the front of the seat without disassembling the harness straps, and the EZ-Buckle? System retains the harness in forward position and keeps your child from sitting on it while boarding. 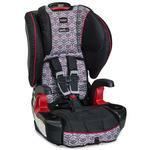 Of course, the Britax Frontier 90 Combination Harness-2-Booster? child safety seat wouldn?t be complete without plenty of comfort and convenience features: it includes an easy front-adjust recline, ComfortFoam padding, ample integrated cupholders and storage, and cozy armrests. Finally, the Easy-Remove cover comes off without disassembling the harness or removing the seat, making cleaning your car seat simple. In short, the Britax Frontier 90 Combination Harness-2-Booster? is a complete package, incorporating state-of-the-art child safety seat technology and making it incredibly easy to keep your child safe on the go.